It will depend on where you get your statistics, but according to many leadership and HR focused organisations – somewhere between 25 and 40% of a manager’s time is spent dealing with conflict. For many leaders who face this challenge, the temptation might be to try and claw back valuable time by simply ignoring the conflict and hoping it plays out to a natural conclusion or call the protagonists into the office to give them “both barrels” before sending them on their way, hoping you’ve heard the last of it. The problem with both of these approaches is that the conflict remains unresolved. It may be “out of sight and out of mind” for you – but for those in battle, the conflict is very much alive under the radar. If the protagonists are not actively battling each other in the office, inside their own minds where there are no boundaries – there’s every chance the conflict is in full swing and wildly out of control… ready to resurface at the slightest provocation. So as a leader, if you do want to claw back at least some of that 25-40% of your time spent on conflict what approach should you use? Well, conflict does not have to be a negative force in your organisation. 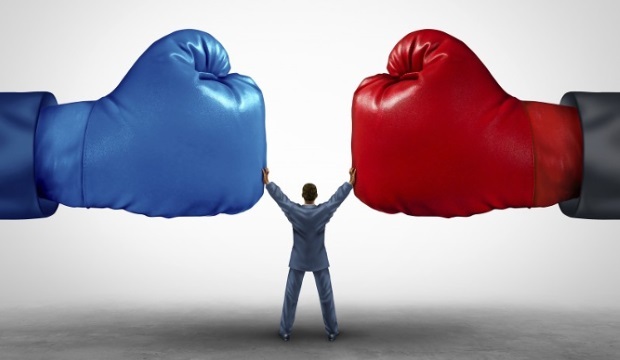 In fact, by embracing conflict and giving it a time and a place in which it can take place in a controlled environment, conflict can actually be hugely positive for your organisation and here’s why. Conflict often arises because people don’t feel listened to and don’t feel their thoughts, feelings and needs are taken into account. By providing an opportunity for discussion around key issues, you can ensure team members are listened to and any information they give, taken into account. Perhaps one of the biggest plus points of doing this is that giving people a voice increases the likelihood of each person buying-in to the ultimate solution. Opening tricky topics up for debate and allowing people to explain their position helps to build an understanding of the interdependencies between different teams and the core goals that each person or team is working towards. Healthy debate allows us to see the bigger picture rather than just our own goals and that promotes openness and deeper thinking when it comes to problem solving. By allocating a time and a place where lively and constructive debate can take place, you’re giving people an opportunity to relay their challenges and their fears in an environment where everyone is committed to finding solutions. Learning how to have a lively and passionate debate without hurling insults at one another builds respect, trust and empathy with colleagues and that leads to a better workplace culture. Conflict consumes enormous amount of time and emotional energy. Even when a person involved in conflict is not directly attacking their opponent, their energy and focus is directed to anger and trying to find a way to “win the battle”. If you’re able to allow conflict to take place in a managed environment where the goal is to find the best way forward, all of that time and energy can be used to push your organisation ahead. Embracing conflict in your organisation can actually make it more agile by allowing change to happen faster. There’s two ways this can happen. Firstly – by bringing people together to focus in a safe way on contentious issues in your business, you’re more likely to find a solution faster. But also by giving people a voice and having their opinions recognised and taken into account, you’ll get less push back later on when you go to put the change in place. With the modern workplace becoming more complex and more demanding by the day – the need to address the effects of conflict and put a strategy in place to utilise conflict as a resource rather than see it as a problem is becoming more important. My name is Patrick Moulsdale and I am a group conflict management expert and professional mediator with over 15 years’ experience. If you are experiencing the effects of conflict within your organisation, contact me today through the form to the right of this post. Thank you for sharing your knowledge in this important area. You have certainly looked at conflict in a way I had not considered before. I have always focused on the cause of conflict and tried to have processes in place that can avoid it. In my experience the main culprits have been poor or non-existent position descriptions which leave people unclear as to who is responsible for what, and poor decision making which has not given consideration to the effect that a decision made in one area could have in another area. In the latter case, matters are made worse when decisions are not communicated to everyone affected. The result is often confusion and conflict. Comments and inquiries are always welcome.